Guests at Hopelink’s Reaching Out Benefit Luncheon raised more than $1.1 million at Bellevue’s Meydenbauer Center on Oct. 21, 2013. Now in its 18th year, the annual fundraiser was the organization’s most successful to date, helping ensure that tens of thousands of local at-risk families and individuals navigate the journey from vulnerability and crisis to independence and stability. 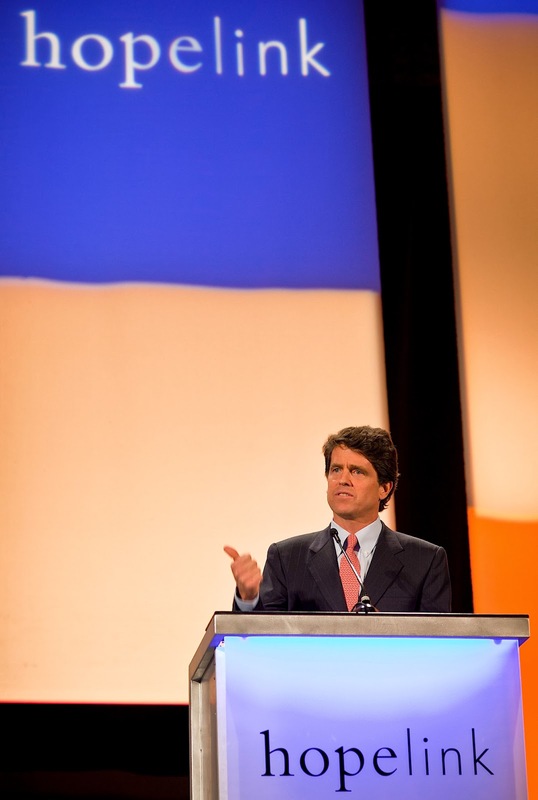 During the luncheon, more than 1,500 people heard keynote speaker Mark Kennedy Shriver share stories about his father, Sargent Shriver, and talk about faith, hope, love and the role Hopelink plays in the community. “The work Hopelink does every day, the work they do on a daily basis, are really acts of hope and acts of love,” Shriver said. The son of Sargent and Eunice Kennedy Shriver, the younger Shriver is Senior Vice President for Strategic Initiatives and Senior Advisor to the CEO at Save the Children, which is working to ensure a fair start for all children in America – including the nearly one in four living in poverty. Shriver’s best-selling memoir, A Good Man: Rediscovering My Father, Sargent Shriver, was published in June 2012. Luncheon guests also heard from Chauncey Pearl, a former Hopelink client, who is now on the Dean’s list in Culinary Arts at Lake Washington Institute of Technology. Redmond-based Hopelink is the largest social services agency in north and east King County, serving 60,000 low-income, disabled and elderly people every year through centers in Redmond, Bellevue, Kirkland, Shoreline and Sno-Valley (Carnation).